The diversified technique is the most widely used technique for manipulation of the spine and extremities. This technique uses a high velocity, low amplitude specific thrust to help restore function to the joint segment involved. The technique allows us to put the joint through cavitation, which helps to adjust any spinal segments that are misaligned, also known as subluxation. If you want to get the best result out of your chiropractic visit, choosing someone who is experienced and well-versed when it comes to spinal conditions is essential, and that is exactly why our existing patients continue to come back to us whenever they need some help and support with their back and body. The diversified technique can relieve pain, stiffness and it can even help you to move more freely without experiencing limitation. It’s one of the most thoroughly proven chiropractic techniques around, and we are here to make sure that you get the best result starting today. If you are interested in finding out if there is anything that you can do to reap the benefits of everything that it has to offer you can count on us to help you with that. Please get in touch with us today if you would like to learn more about this technique. We would love to provide you with all the help and support you need to reach your optimal health. One of the many unique benefits of the Thompson Technique is that it can be used to detect any disparities in the length of the legs. This is done when the patient is on the table, and the patient’s feet are then flexed to uncover any underlying issues. This gives us the chance to find out if there are any adjustments that need to be done. The patient reclines on the table that is set to their own weight, where we can then lower the table to find out which part of the spine needs to be adjusted. Some of the benefits of the Thompson Technique include the fact that it can help you improve your posture and it can also help you boost your level of flexibility. It is great if you have experienced injury and our patients often state they have reduced aches, pains and even a higher tolerance to muscular stress. We have been performing the Thompson Technique for years now, and we are proud to say that we have experienced a tremendous level of success with it. Our patients tell us they feel the benefits after just a couple of sessions and this is the best way for you to put an end to any back issues that you are experiencing. We are confident in our ability to deliver the Thompson Technique effectively and have experienced a huge level of success with it. If you want to find out more, then please do get in touch with us today to see how we can help. We would love to hear from you. What is an Impulse Adjusting Instrument? With advancing technologies in all fields of medicine, chiropractors have acquired new tools to assistant in the delivery of chiropractic adjustments. A patented and FDA registered laser treatment was newly created specifically to deliver more gentle and more precise chiropractic adjustments to joints in the spine and extremities as a way of relieving pain and restoring function. Why use an Impulse Adjusting Instrument? Sito Chiropractic and countless other doctors around the world are implementing the use of Impulse Adjusting Instrument as a safe and effective treatment for their patients. 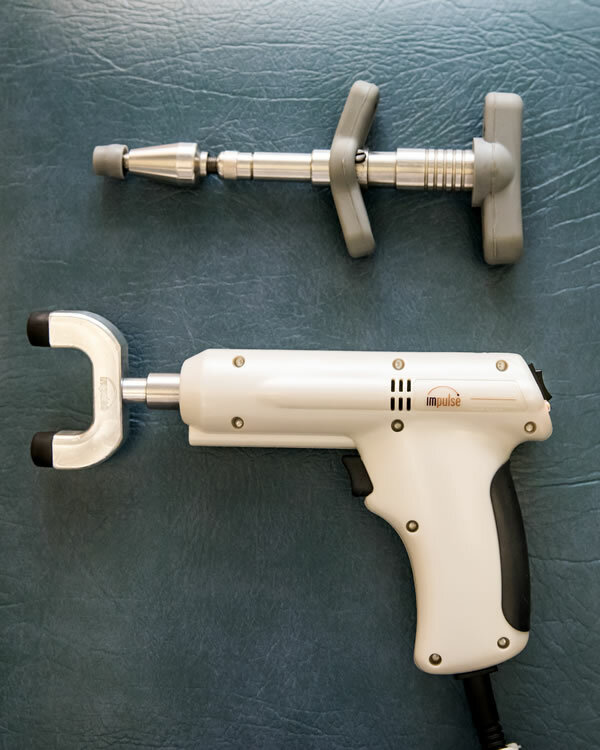 The Impulse Adjusting Instrument uses micro-computer circuitry that produces a controlled force chiropractors use to treat different areas of the body. Adjustment with the instrument works to restore the body’s balance and functioning. It aims to correct the underlying cause of your symptoms with treatments that are as painless as possible. With the Impulse Adjusting Instrument, chiropractic adjustments on the area that is being treated feel like a light tapping. In most cases, many patients feel a relief of pain after the adjustment and improved mobility. The treatment is painless, and others report a sense of well-being or a soothing, calm feeling.